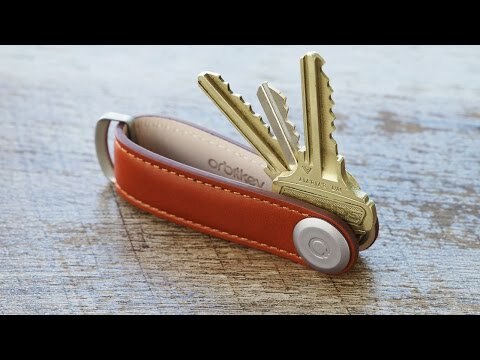 Orbitkey transforms your cluster of keys to a neatly organized stack. You can arrange keys in your order of preference, which will help you locate the right key quickly and effortlessly. *Note: Does not include bottle opener. Once you get used to flipping your keys out of the sheath, Orbitkey is definitely the best key organizer I've ever used. It keeps loose keys from deteriorating your pant pocket, always neatly folded together like a pocket knife, simple but brilliant idea that really works. The rubber material is high quality, doesn't degrade, stays flexible and soft. The hinge mechanism is nicely done, smooth on the exterior surfaces and easy to use once the keys stack is cinched down so there just enough friction to keep the keys in place but easily flip out. I have tried another product to hold my keys in a small package so it is easy for me to carry it around. That product was a bit disappointing.